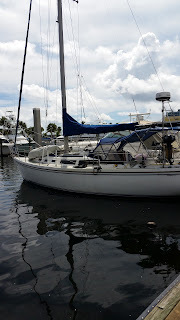 We're planning on spending Friday Thru Monday on the boat, joining a bunch of sailing buddies for the Annual Chili Cook Off, and I'm hoping to do some cooking on the boat that is not just heat up the Seal-a-Meals we have prepared in advance. We normally take at least a full loaf of whole wheat bread, more if over 4 days. That covers Breakfast Skillet Toast and Lunch Sandwiches. This weekend I want to Bake Bread on board. 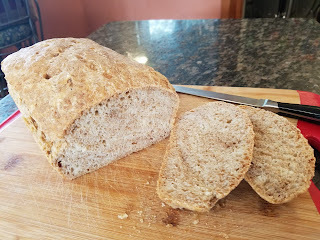 I got into bread making about a year ago and just could not bake anything other than Wheat Rocks! They turned out more like Biscotti than Bread. A good friend helped with advice, but I was doing something wrong, they tasted good, but really didn't need to be toasted, they were already like rock the morning after baking. Over the past weeks, I've been practicing baking bread following Steve Gamelin's No-Knead Bread Cook Book, and very successfully too! So far I have made about 6 loaves of Whole Wheat Bread. Several of the loaves turned out nice but many had an unintended split. I learned from the Cooking On Boats Facebook Group that it was known as 'Oven Spring' and I figured it was caused by our Oven's 'Convection' setting. 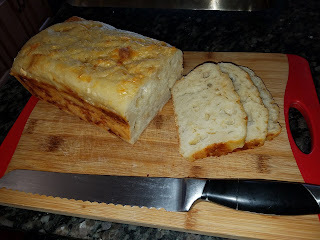 The bread still tasted great, had a good crumb and was cooked evenly all the way through. This loaf turned out really well. 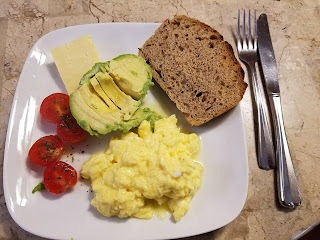 It toasted really well and with Avocado, Scrambled Eggs, Mini Toms, Cheshire Cheese, it made a great breakfast. There's something about home made bread that makes a huge difference at breakfast time. Something to do with the fact that it's not from the store and that it was made with that extra bit of excitement as it comes out of the oven. 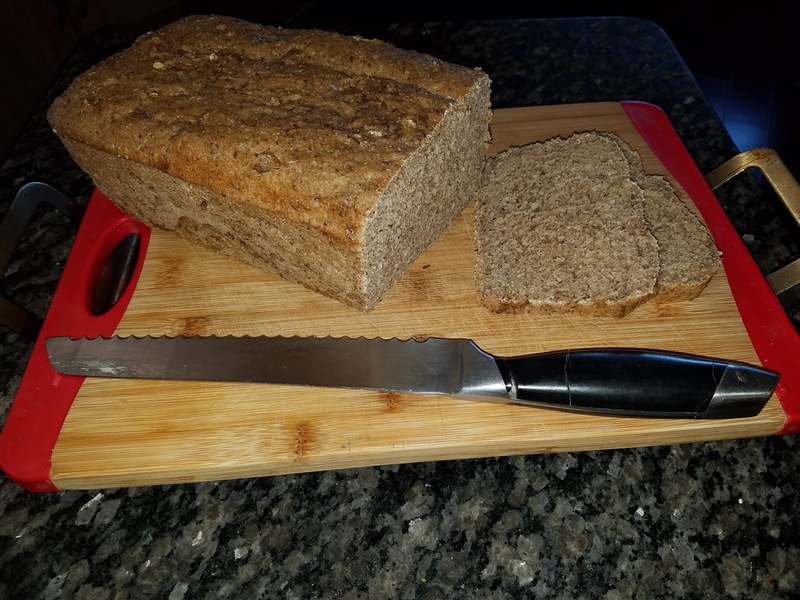 This was my multi seed bread, no Oven Spring (cooked on regular 'Bake' setting), and was really tasty. Whole Wheat PMDO sCrumbstios Whole Wheat Flour, Bread Flour, Flax Seed, Caraway Seed, Fennel Seed, Oats D-Licious! Then some good friends invited us for their Birday celebration, their Parrot was 40 years old! 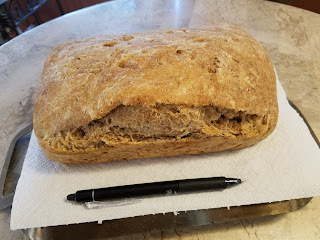 So I planned on taking a loaf to help feed the crowd. This would be my first White Bread loaf. Intimidation was low because Whole Wheat Bread is supposed to be difficult compared to White Bread. The dough should have risen within 90 minutes, but did nothing, I was ready to toss it out. Peggy said just let it proof overnight. So we took two bottle of wine instead of one. Sunday morning, it had risen quite a bit, not what I have been used to seeing, ready to toss it again. Peggy said 'Bake it!' So I did, it's awesome. Just cutting the bread brings out the flavor of the Gruyere cheese. Now, it's time to get ready to bake a loaf on the boat. This is a perfect time to try it. We're heading up to Lake Boca on Friday for the HISC annual Chili Cook off. We'll be at Lake Sylvia on Friday night with friends coming along side after they finish work for the day. I plan on putting my first Bread on the Boat together starting Friday Night. Harvest 8 Grain Whole Wheat Bread, cooked in a Bread Pan. The method requires a two step mix. Step 1. Yeast, Salt, Sugar, 8 Grain mix that gets added to the Water and Olive Oil, yeast 1st. So I'll make a baggy of Salt, Sugar, 8 Grain mix, and take along a packet of Yeast and a bottle of Olive oil. Step 2 is to add the Flour: Whole Wheat Flour and Bread Flour - I'll prep them at home and take to the boat in a 2nd baggy. I'll need a mixing bowl (don't have one on the boat right now) and a couple of identical bread pans, one to act as a lid in order to create a Poor Mans Dutch Oven. Maybe the excitement of baking will wear off someday, but for now, I'm happy that it doesn't take much to brighten my day. Heading out on the boat and baking bread - simply pleasures are sometimes the best.